Salvia officinalis – from the Latin word “salvere”- the name means “to save” and refers to its alleged curing properties. Ancient Egyptians promoted it as a brain tonic; the Chinese believed it promoted longevity, strengthened the memory and sharpened the senses. Through the centuries, this herb has maintained its reputation. Back in the ninth century, Walafrid Stabo wrote in his The Little Garden: “Among my herbs, sage holds the place of honor; of good scent it is and full of virtue for many ills.” Gerard mentions sage as being in 1597 a well-known herb in English gardens. Salvia officinalis is still listed in the Medica Pharmacopia of the United States. Looked upon as a general tonic herb, sage tea is taken for colds and coughs. For a sore throat or cough, pour a pint of boiling water on a handful of sage leaves. When it has cooled, add a little vinegar and hones. Take a teaspoonful at a time; this may also be used as a gargle. It is considered an excellent remedy for laryngitis and sore throats. A cup of the strong infusion of this herb is recommended as a remedy to relieve nervous headaches. Dried leaves have been smoked in pipes as a remedy for asthma. This herb’s antiseptic properties are also effective in the mouth; fresh leaves, rubbed on the teeth, will cleanse them and strengthen the gums. Our forefathers knew to apply a hot compress of bruised sage leaves to relieve the pain of sprains. A strong infusion is an excellent lotion for ulcers and to heal raw abrasions of the skin. It has also been used as an application to the scalp, to darken the hair. The Salvia family numbers over seven hundred species; we will be looking at those plants classified as sages – the herbs recognized for their usefulness to mankind. There are several sages helpful either as a culinary, medical, fragrant and decorative use. Salvia officinalis (common garden sage) is the most familiar. In Yugoslavia, fields of this sage are planted and harvested three times a year just like wheat or hay. The crops are exported and end up on your grocery spice shelves. Recent years have seen an introduction in our nurseries of a cultivar called ‘Bergartten’ which shows itself to be a hardier, more productive plant with larger leaves. Look for this particular herb if you plan to add sage to your kitchen garden. S. officinalis ‘Aurea’ (golden sage) handles hot, humid conditions much better than its parent. Nearly all salvias sprout easily from seed sown in spring in a sunny location. They may also be propagated by taking 3-inch tip cuttings. Another cultivar that makes a striking plant in your garden is Salvia o. ‘Purpurascens’, commonly known as Purple Sage. Also a perennial, it grows twelve to thirty inches with leaves that begin a deep, rich purple when new and become a powder green as they age. The foliage has a hearty, sausage-like smell. 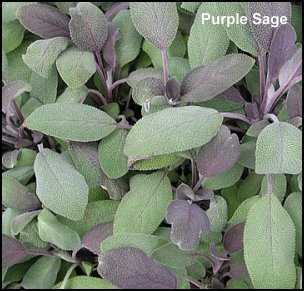 Its flavor is comparable and can be used wherever garden sage is used in the kitchen. Prominent among the ornamental sages is Salvia elegans (Pineapple Sage.) A tender perennial variety, it should be grown in pots if your winters are severe. This variety grows to three and a half feet in height and roots easily in water. Here in East Texas, I can keep it in the garden year-round, but it dies back to the ground in the winter and doesn’t begin to reappear until Spring temperatures are quite warm. The light-green leaves have a delightful fruity fragrance reminiscent of pineapple and make an enjoyable tea. I also dry the leaves to add their scent to my potpourris. The bright red flowers that appear in fall are a strong attraction to hummingbirds. Try using pineapple sage to flavor jams and jellies. 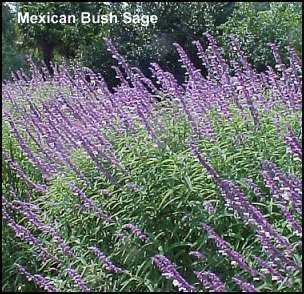 Another sage worth adding to your herb garden strictly for its ornamental value is Salvia leucantha (Mexican Bush Sage.) Grow this at the back of your bed as it attains four feet of height in just one season. This is also a tender perennial that I have successfully overwintered in the garden. The fragrant gray-green foliage becomes a delight for the eye in the fall when it produces long spikes of soft lavender flowers. These dry beautifully and are an excellent candidate for floral arrangements or as an addition to potpourri mixes. Clary Sage (Salvia scarea) has been grown primarily for its medicinal value. An herb of great growth (give it lots of room), “clear eye” a name it is sometimes commonly known by, was thought to cure eye infections and is still used as an eye wash. This sun-loving plant reaches four to five feet in height in a growing season. It is a biennial which produces a basal rosette of leaves the first year and tall spikes of bluish white and rose flowers the next year. If you’re interested in making wine, boil the leaves and flowers of S. sclarea with sugar, It’s known in France as Toute Bonne – for its medicinal virtues. There is an annual Clary Sage (Salvia horminum) which grows to two feet, has white, pink or purple flowers and no scent. It does not have the medicinal properties of S. sclarea but if the leaves and seed of this species are put into the vat, while fermenting, will greatly increase the inebriating quality of the liquor. There are a host of other salvias to beautify your landscape. Among those readily available, S. Coccinea, commonly referred to as Texas sage, is a low-growing species with rich green leaves and striking scarlet flowers. It is usually grown as an annual. 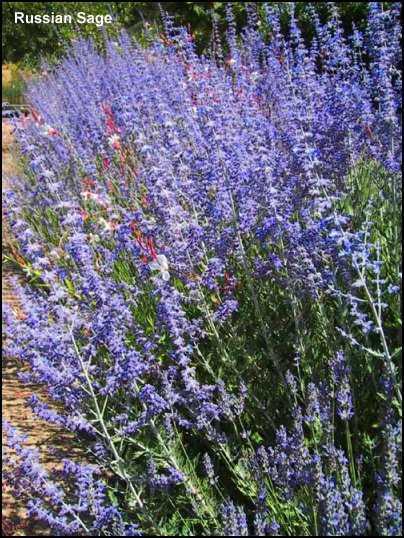 A salvia native to the American Southwest, S. Columbariae grows to twenty inches. Also known as chia, this sage is grown primarily for culinary use. Another Texas native, S. Greggii has become a familiar sight in our gardens. This woody perennial grows to three feet; has lovely carmine, fuchsia, pink and purple blooms with gray leaves. S. farinacea, mealy-cup sage, is a blue-blooming Texas native with several cultivars, one white-blooming. This perennial grows to three feet. If you plan to grow your own from seed, be sure to get fresh seed as sage seed has a short lifespan. With fresh seed, you will be rewarded with quick germination. You will have to wait until the second year for fullness of growth. This is a hardy perennial which can reach heights of twenty-four to thirty inches when mature. It can be propagated in the spring by pulling off new shoots from an older plant (pull downward to take a piece of the main stem’s covering if possible). Stick them in a prepared pot or bed, protect from the sun and do not disturb until new leaves tell you that a root system has formed. Old plants should be renewed every three or four years. One way to do this is by mound layering. Make an earth mound over the old plant, leaving just the tip ends exposed. Two months or more later, the plant can be uncovered and each branch with newly-developed roots may be severed and planted individually. Established plants should be pruned in early spring (that’s March for my part of the country) and again in midsummer or after the plant finishes blooming. Do this by taking about one-third of the branch tips each time. This encourages bushiness and a heavier harvest. Sage plants tend to lose leaves on the lower parts of its branches. Regular pruning will prevent long, leggy branches with a few leaves at the end of the stem. Do not over-water; sage is very drought-tolerant. Keep the soil evenly moist; a protection of leaf mulch year-round does the job very well. Be sure your soil drains well; sage is easily killed by over-watering or soggy soil. Insects and disease are not usually a problem with sage but hot, humid weather will take its toll on all gray wooly varieties. As a companion plant in the garden, sage will improve the flavor of cabbages and repel the cabbage butterfly when grown nearby. Grow it with carrots, strawberries, tomatoes, and marjoram but sage and onion dislike each other so keep them apart. Rosemary and sage are good companions in the herb garden having a stimulating effect on each other. Salvia officinalis stays gray-green until mid-December in mild winters and starts to revive in March. Hold off the first pruning until you can see evidence of new growth. When it is in full flower, a deep soaking will intensify the color of the blooms. Cut back the stems after the plant has finished blooming. 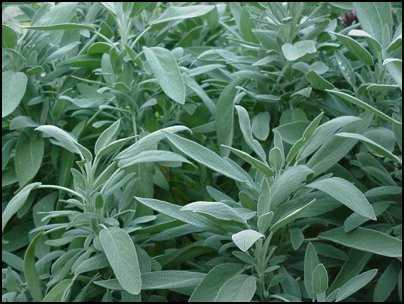 Sage leaves are at their highest fragrance and flavor just before flowering in early summer. Sage branches can be gathered into bunches and hung upside-down to dry in a place out of direct sun where there is good air circulation. I prefer to strip the leaves and spread them on shallow trays to dry. If the humidity is high, as it is much of my summer, I place the tray in the oven with the temperature on its lowest setting, removing when the leaves are crispy dry. Sage can be frozen for convenience in adding to simmering pots. Chop fresh sage very finely, fill ice cube trays then cover with water and freeze. When needed, just pop out a cube to add to any slow cooking stew or soup. Besides traditional turkey stuffing and sausage seasoning, sage is a handy ingredient in the kitchen. Use it to flavor cheese, egg dishes, cooked vegetables and fish. Because sage is considered a dominant herb, it is best not to mix it with other strongly-flavored herbs such as rosemary, basil, thyme, oregano, and tarragon. Drink sage as a healthy and/or refreshing tea, make it into wine, use it in cheese spreads and herb butters. Even the young leaves make a tasty addition to the salad bowl or placed between slices of bread…a delicious sandwich. So, whether you want to use sage in the kitchen, in the medicine cabinet, or to beautify and freshen your home, be sure to keep a variety of sages growing in your garden. They will add enjoyment to your life. Sage is a hardy perennial sub-shrub with woody, wiry stems that are square and covered with down. Flowers grow in whorls of four to eight at axils; pink, purple, blue or white; tubular, ½ – 3/4 in. Long; two-lipped; upper lip straight or arches; ring of hairs inside; purplish, bell-shaped calyx. Leaves are opposite on stem and grow to 2 in. long; pebbly and pucker-veined, as if made of wrinkled seersucker; grayish green, softly hairy or velvety; round-toothed margins; long-stalked. The soil should be slightly alkaline, with little moisture needed once the plants are established. Sage is hardy from zone 4 through zone 8. Grow in full sun. Sage is native to the northern Mediterranean coast. Some people say sage fragrance induces sleep. Attractive to bees, it produces an aromatic honey. Sage infusions have been used to color silver hair. Sage tops yield a yellow-buff color to wool. Containing antibacterial properties, sage can be used as a natural food preservative. Sage was believed to bestow wisdom and improve the memory. In the language of flowers, sage represents good health and domestic virtue.